A DevWars recap! Let's do this! This week BenStanley (blue) went up against eqApe (red). With nothing but an HTML page and their own CSS, these two duked it out in a battle to the death (sort of). Blue made great use of the DevWars colors with a light theme (as opposed to DevWars' dark theme). It brought some nice contrast to the table with great buttons and page structure. Red has a similarly light theme with a nice dual-colored menu and icons. Towards the bottom of the page, some formatting CSS was left out, but they still did great. 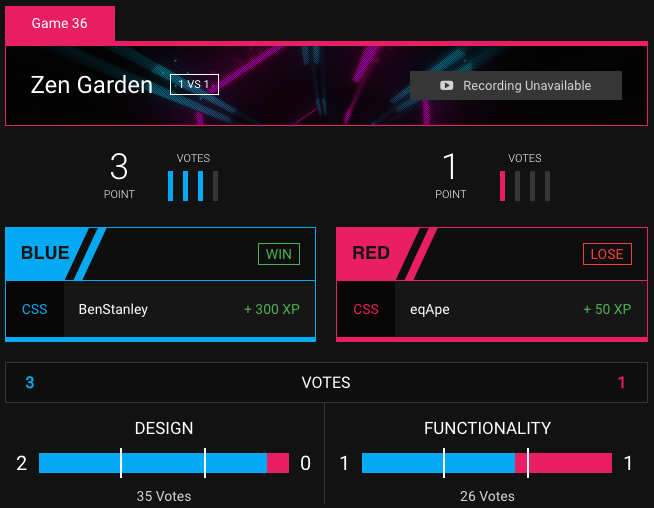 Blue almost aced this game, but red pulled out a point in the functionality vote to prevent it. Both players did fantastic. For the classic game, we had PavilN, gavin, and BitsPls (using Beau's DevWars account for reasons) (blue) go up against BenStanley, MisterDude12, and Koroeskohr_ (red). 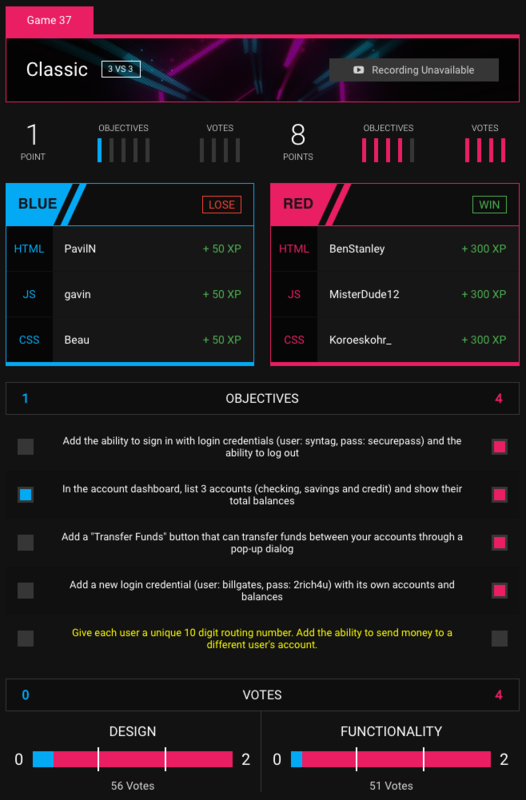 Red team got their entire site working aside from the bonus objective, so users could log in and withdraw money from various accounts. It was pretty fun to use actually. Blue team had a bit of trouble getting logins to work correctly, but they did complete the objective for listing three types of accounts. Both teams did well; this was one of the more difficult DevWars challenges we've given. That concludes another DevWars summary! There will be another DevWars this Saturday, so we highly recommend that you check it out and maybe sign up for a game! Wanna participate but don't want to compete during one of the normal games? Check out our weekly challenges on CodePen!